While you are in Himeji this is a good “other trip” if you are tired of castles and not yet tired of temples. This is a temple that is a little bit different and not really a tourist place. You may see pilgrims in traditional clothing making the trip from temple to temple. There are also very good views of the city of Himeji and the hills to the north. This can be a very quiet place and people go there to pray. Take the JR to Himeji (or Sanyo). At Himeji station cross the street (straight ahead) to the bus terminal. Take the #6 or #8 bus to Mt. Sosha (the buses are marked in romaji). I think the #11 goes there too as I took one back from there. These are city buses and the ride may be crowded and bumpy, but it is only about 20 minutes. When you get to Mt. Sosha (the last stop) there is a rope way up the mountain. At the top, there is a pleasant uphill walk through cedar trees. There are horse-drawn carts that can take you up but that is not really necessary. 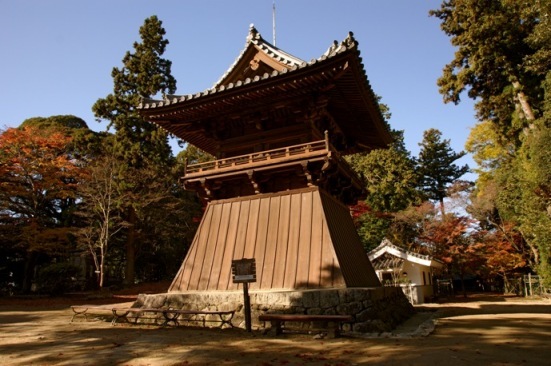 There are a number of buildings associated with the temple, and most have a brief explanation in English. There is also a shop where you can get something to eat.